A request from the principal of Stevenson Middle School to expand on previous professional development work CRDG had conducted at his school has resulted in another partnership funded by the HIDOE Math Science Partnership program. The project, conducted by CRDG’s Hannah Slovin and Melfried Olson, goes beyond the whole-school approach to involve all of the mathematics teachers at the middle school plus teachers at two of its feeder elementary schools. The project, now in its second year, uses a professional development approach known as lesson study, a model first developed in Japan, that guides teachers in planning lessons with a focus on students and their understanding of a lesson. From a teacher’s point of view, this is a very different approach from looking at a lesson primarily in terms of what the teacher does to teach the mathematics. In lesson study, a group of teachers collaborate to plan a “research lesson” that becomes the basis for inquiry about their practice. Classroom observations, modeling of effective practices, and strengthening of teachers’ content knowledge are all part of the extensive professional development work CRDG’s mathematics faculty provides to teachers throughout Hawai‘i. Building on CRDG’s many years of research, teaching, and professional development work in algebra, Mike Gilbert is taking the opportunity of revising CRDG’s algebra curriculum materials to expand into new areas of research that focus on measuring and improving teachers’ content knowledge for teaching mathematics. While many studies say that teachers need to continually learn mathematics content, few programs provide teacher support materials that allow teachers to learn as they teach. Gilbert is involved in two projects in Hawai’i schools that both use this approach. The Designing Algebra Resources for Teaching (DART) project works with thirty teachers from Moanalua, Mililani, and Washington middle schools. Monthly full-day professional development sessions model mathematical tasks the teachers might use in their classrooms, demonstrating multiple entry points for problems and solutions that may be algebraic, graphical, numeric, visual, and contextual. As Gilbert puts it, ” We do the math then unpack the math, tying it back to teaching practice.” Following these discussions, teachers work in groups using the lesson study model to create new lessons. The College Algebra Readiness for Every Student (CARES) project also uses an educative curriculum approach in working with high school students and their teachers. The goal of the project, which is working with teachers and students in three Hawai’i high schools, is to prepare every student to enter college ready to take credit-bearing courses in mathematics. In addition to direct interventions such as providing students with access to online placement tests, the project works with teachers to increase their content knowledge for teaching. Students and teachers at Kapālama Elementary School are engaged in a whole-school program to improve mathematics understanding. The story of the Measure Up project demonstrates how CRDG’s research touches the community and has a direct impact on schools and students in Hawai’i. Based on a program created in Russia, the Measure Up project started in 2001 when mathematics researchers at CRDG began adapting the translated materials for a contemporary audience and researching its development of algebraic thinking in children as young as first grade. Measure Up’s unique approach to learning mathematics not only includes reading, writing, speaking, and critical thinking, but also stresses multiple representations and connectivity. 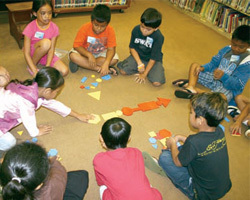 In 2004, the CRDG mathematics faculty was tapped by the Hawai’i Department of Education to do a series of professional development sessions for all the schools in the Honolulu District, and much of what they did in these sessions came out of the research they were doing in Measure Up. These sessions resulted in a number of ongoing relationships that have led to a robust program of professional development for HIDOE teachers. 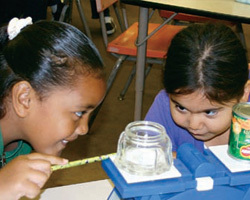 Students from Kapālama Elementary School benefit from the research done in the Measure Up program. 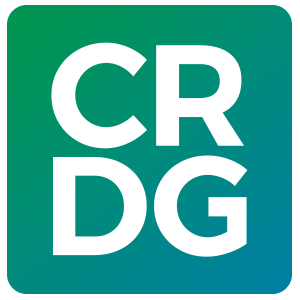 In the summer of 2009, CRDG’s Maria DaSilva and a teacher from Kapālama Elementary School team-taught a two-week summer class for students based on the Measure Up curriculum, while CRDG’s Claire Okazaki and Fay Zenigami taught a course for teachers. This course included Measure Up early grades mathematics content and incorporated observations of learning in the Measure Up class being taught to the Kapālama students. The success of this approach resulted in yet another request from Kapālama that led Melfried Olson to apply for federal funds through the HIDOE Math Science Partnership program. The Kapālama Algebra Readiness in the Elementary School (KARES), a three-year project for the entire faculty of Kapālama Elementary School, is intended to improve teacher content knowledge in mathematics and the process standards. I believe the most interesting thing about my visit was seeing how enthused the children were. It seemed as if every student was motivated to learn. I was surprised to see how capable these students were in learning what seemed “advanced” to me. I was shocked when I first heard one of the students using the word supplement. I questioned if they actually knew what that meant, but after much observation it was clear that they did. I think the Measure Up program is very similar to our Math 112 class in that we are learning to explain and think about math concepts. It was interesting to see an elementary program so similar to a college program. 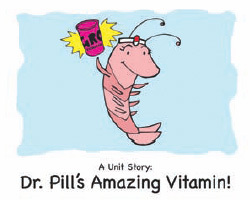 Another outcome of the Measure Up research is the publication this year of A Unit Story: Dr. Pill’s Amazing Vitamin in print and DVD versions. This fanciful tale about a town of shrimp citizens and their problem-solving doctors helps students develop a conceptual understanding of the number line. Since many elementary textbook series present the number line as a “given,” this storybook is a unique resource on the construction of a number line that can be used to supplement any elementary mathematics curriculum. The TI-Navigator system allows formative assessment to go on in this networked classroom at ULS. An ongoing relationship with Texas Instruments (TI) became formalized when CRDG’s Judy Olson, Melfried Olson, and Hannah Slovin received funding from the National Science Foundation (NSF) to investigate the use of formative assessment practices in mathematics to determine if networked calculator technology created by TI has a positive effect on student achievement. 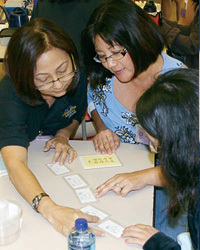 The Formative Assessment in a Networked Classroom (FANC) project, in its third year, involves thirty-one teachers in fifteen middle schools in Hawai’i with a specific focus on algebraic concepts, the use of formative assessment, and the use of the TI-Navigator system and TI 73 calculators in networked classrooms. The TI-Navigator system allows the teacher to view every student’s progress on the calculator in real time. There are many advantages to this system as a formative assessment tool: information can be transferred between the teacher’s computer and students’ calculators instantly, students’ work can be assessed and displayed for classroom discussion, and teachers can pre-store formative assessment questions and send them to students at the appropriate moment. FANC research questions address students’ growth in achievement, teacher and student opinions and attitudes, and teachers’ effectiveness in implementing formative assessment and the TI-Navigator system. This is a departure from the bulk of the research on technology systems that focuses primarily on the technology, and much less on the formative assessment strategies it allows to go on in the classroom. As the FANC project was ending, Melfied Olson applied for and received funding from the HIDOE’s Math Science Partnership program to continue working with teachers at Kalākaua Elementary School. The new project, which leverages the four TI-Navigatorequipped classrooms provided by the FANC project, provides professional development to all mathematics, special education, and English language learner teachers over a full school year. A second NSF-funded project that was completed this year studied the role of gender in language used by parents and children working on mathematical tasks. Funded by the NSF’s Gender in Science and Engineering program, the three-year study investigated genderrelated differences in language and actions of one hundred third- and fourth-grade childparent dyads working on mathematical tasks, asking to what extent gender-related differences informed children’s self-efficacy in mathematics and parents’ competence beliefs for their children’s success in mathematics.